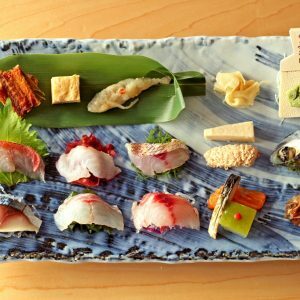 It is unusual for japonica to write twice about the same restaurant but Kafuka deserves a follow-up. We recently managed to secure seats there at short notice, and were rewarded with an eclectic meal that was both impressive and entertaining. Chef Ito, who greeted us with a friendly smile and a warm “konbanwa,” or “good evening,” served a tasting menu of creative dishes and comfort food that was a steal at Y6,000. From where we sat at the counter, we were able to enjoy watching the chefs checking the progress of whatever sat in the oven, putting finishing touches to an appetizer, or preparing a dessert from scratch. Our meal began with a small cup of crab bisque that was creamy and aromatic but not at all heavy. 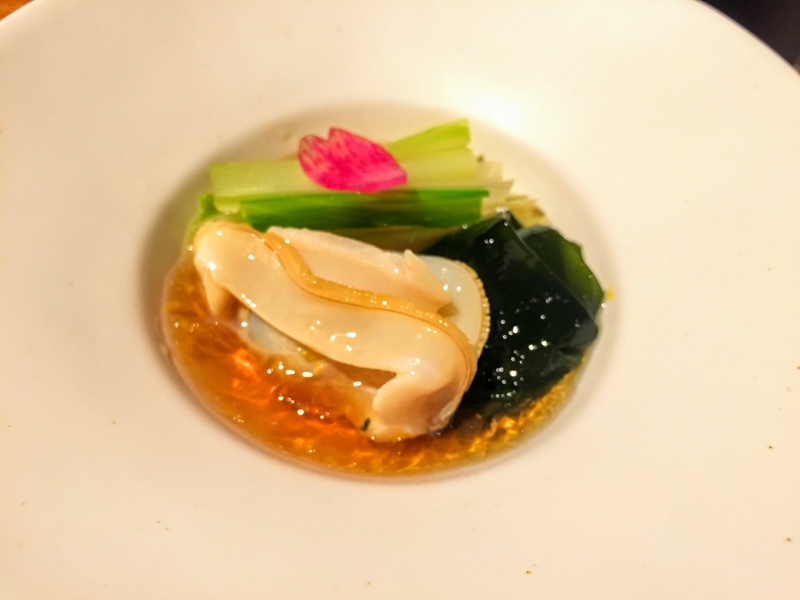 This was followed by a beautifully arranged assortment of hamaguri clam, wakame seaweed and urui (a mild green mountain vegetable of the hosta family) in a Tosa vinegar gelée. The refreshing vinegar dressing was a perfect counterpoint the creamy bisque that preceded it. The large but tasty hamaguri clam. For the sashimi course, chef Ito chose to break from tradition and serve slices of firm sea bream with a light dressing of konbu, or kelp. This dispensed with any need to dip the fish in soy sauce, in the usual way that sashimi is eaten, as the konbu dressing provided enough seasoning to enjoy it on its own. 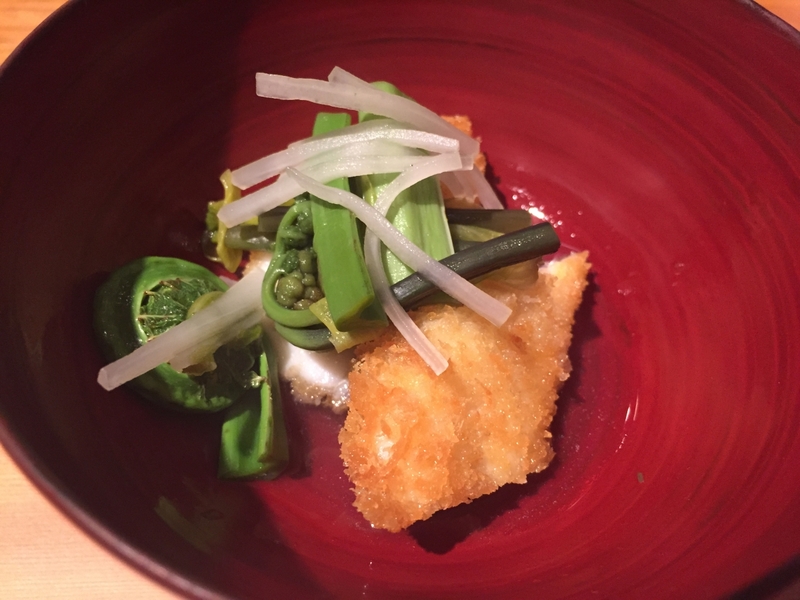 The next course was fried fugu (blowfish), topped with simmered mountain vegetables marinated in dashi broth, providing a a freshness and texture that beautifully complemented the crisply fried fish. For the second fish course, chef Ito served grilled sawara, or Spanish mackerel, lightly marinated in miso, in a style called saikyoyaki. 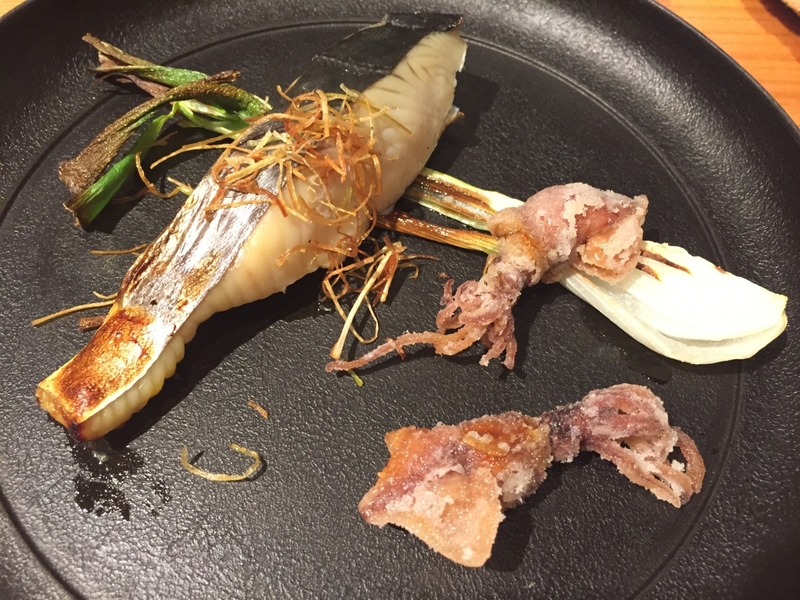 This was accompanied by fried hotaru-ika (firefly squid) and grilled green onion. The sawara was soft, fleshy and seasoned with just the right amount of miso that I could notice the flavor but was not overwhelmed by it. 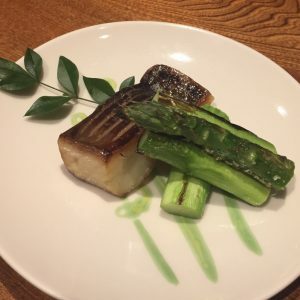 The soft flesh of the sawara was beautifully complimented by the grilled hotaru ika. I had started the meal with a glass of sparkling wine and at this point, I overcame my initial reservations and ordered the red wine that was offered by the glass. 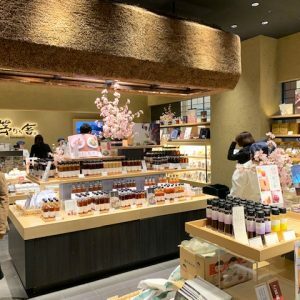 My hesitation stemmed from the fact that, in addition to sake and other drinks, Kafuka almost exclusively serves wines made in Japan, and I have generally found Japanese wines to be rather disappointing. Nevertheless, encouraged by the relatively good quality of the sparkling wine, I decided to try the glass red. I can happily report that it was reasonably good. The main course was grilled Duroc pork http://nationalswine.com/about/about_breeds/duroc.php, a favorite of chef Ito’s, with slices of taro (a kind of mountain potato), beets and fuki (butterbur) topped with a Tasmanian mustard sauce. 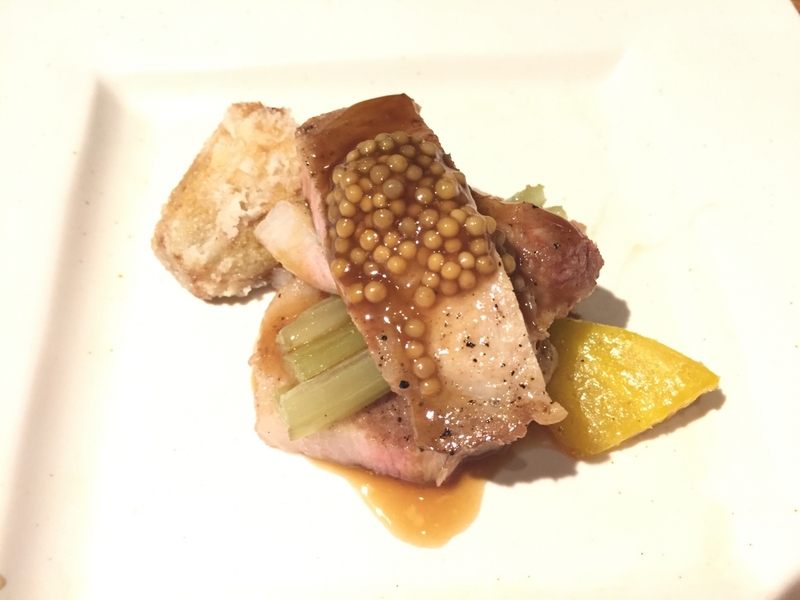 Duroc pork with large-grained Tasmanian mustard. I found the Tasmanian mustard, which I had never had before, intriguing. It is not at all spicy and the rather large mustard grains gave the sauce a distinctive crunchiness. This discovery led to an interesting conversation about Tasmania with chef Ito, who spent 10 years working at restaurants in Melbourne. Busy as he was behind the counter, Ito-san was happy to provide us with tips on traveling to Austraila’s remote island state, famous for its carnivorous marsupial, the Tasmanian devil, and natural beauty. 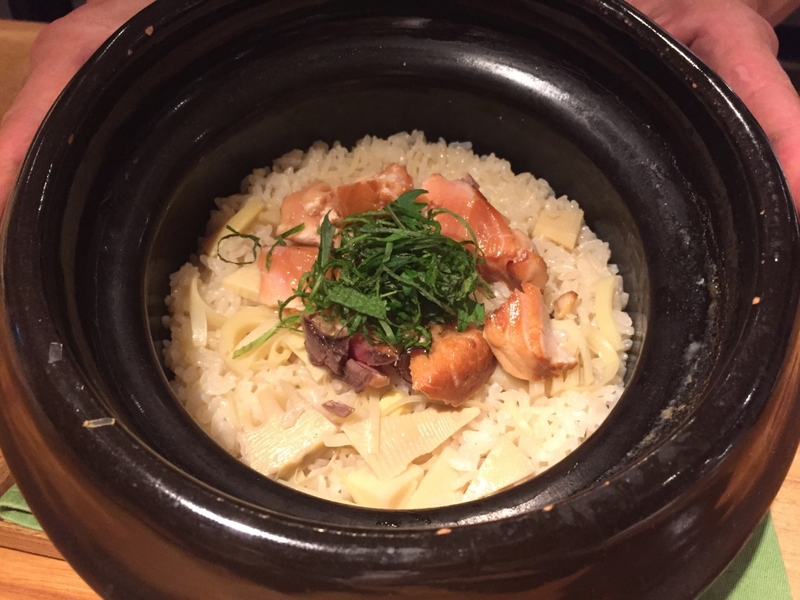 Chef Ito serves a combination of Japanese and western-style dishes at Kafuka, but we were thrilled that he closed the meal with a pot of rice, smoked cherry trout and bamboo shoot cooked the traditional way in a heavy ceramic donabe pot. Rice from Kochi topped with smoked salmon, bamboo shoot and shiso and cooked in a donabe. While every dish that came before was delicious, for me this was the highlight of the meal. The cherry trout was full of umami, or savory flavor, the bamboo shoot was cooked to just the right amount of crunchiness and the rice was fluffy yet firm. Being Japanese, rice cooked in a donabe is the kind of comfort food that adds a truly Proustian aspect to a fine meal. We left Kafuka that evening with a brown bag of onigiri, rice balls, to eat for breakfast, feeling fortunate to have a place to go to for high-quality cuisine in a casual setting so close to home.